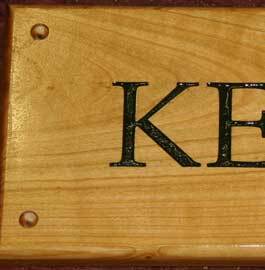 The letters can be in any of our many fonts - CLICK HERE and can be painted black, bright blue, navy blue or green. For some other fonts and ideas have a look at the Gallery page. We can include simple images on the signs. We have a selection CLICK HERE - or you can send in your own artwork - It must be a silhouette style image without any very fine lines or shades. The cost is £7.50per image for a standard image from our standard image gallery or £27.50 for your own. Maybe this one should have been made in oak! Made in the UK. 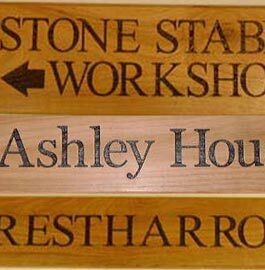 Our team at The Sign Maker looks forward to helping you with your cherry wood sign.